WOOOWOOO. 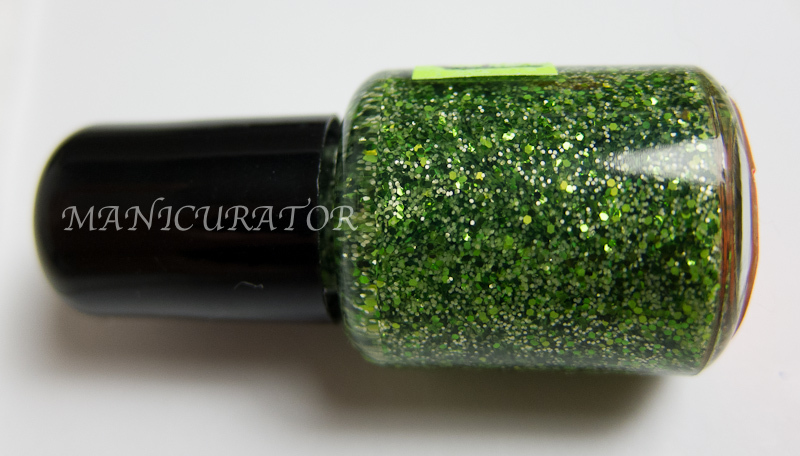 Here comes part 1 of the Halloween Collection by F4 Polish. There are 7 polishes in total, I'll show you 4 in this post and 3 in the next post. You can currently pre-order the entire collection and save $4 from their Etsy shop. I believe they are also having a 10% off sale until Friday, check their Facebook for more details. Drunken Zombie in it's own green-yellow base. I didn't layer it over anything. Swatches show 2 coats. Perfect formula, no fishing for glitters. All swatches are shown with HK Girl top coat. F4 Green Goblin over Manglaze ILF. I'm sure they will be honored, but it only seemed right...layering these Halloween polishes over Manglazes. If the fit is right, wear it!! :D All of the top coat glitters I used one coat, perfect formula, great coverage, no fishing for glitters. The usual high quality I've come to expect from F4. As usual, when I layer over a polish, I like to show you the "undies" so you see how the top coat changes it. Manglaze you know, is matte (the best on the market I believe!) but when top coated...is just gorgeous. Phew! Now, stay tuned for part 2 with the remaining 3 polishes in this collection! Which one is your favorite? I'm loving Hocus Pocus and Green Goblin! *Disclosure - These were sent to me for my honest opinion and review. gorgeous! i love the color combos you chose for these too! Love all the combos! especially Hocus Pocus and Lesbi-Honest! I love these! I think my favorites are Hocus Pocus and monster mash. Your swatches and nails are so gorgeous! They're all gorgeous!! Awesome swatches and photos!! Monster Mash on Cabron! THAT is gorgeous!! I love your combos, they really give the polishes a totally different look! Oh god, monster mash! I need you! I love all your work!! !I am a very BIG fan!! !